Strawberry, one of the most delicious fruits ever, has been the main ingredient for numerous mouthwatering recipes worldwide. Strawberry has enticed many and is often symbolic of love and desire. Now imagine yourself ambling through rows of strawberry, plucking the juicy fruit with your own hands and tasting as many as you can eat. What a tempting fantasy, isn’t it? And what if it were to be true? Nope, we are not kidding. If you don’t believe us, come down to Panchgani for free Strawberry at the Panchgani Strawberry Festival and eat as many as your desires can manage and stomachs can hold. Fresh, juicy, free strawberries right off the plants. Panchgani is known as strawberry country. The temperate climate of the region makes it an excellent location for strawberry production. Hardly a few 100 km from Mumbai, Panchgani is an ideal place to avoid the intensity of the Indian summer. The ruling Britishers, before India’s independence, saw the potential of this place and established Panchgani as a summer retreat to avoid the humid climes of commercial Mumbai. They also saw this as an ideal location for growing various crops like strawberries (which are still favored on the isles and usually associated with some of the most hallmark events like the traditional strawberry and cream served during Wimbledon). The locals adopted the crop and have continued to cultivate it over the years. Yet, the crop didn’t catch on until recently, when the demand for strawberries started giving high returns in comparison to the other traditional crops. Now this region (Mahabaleshwar, Panchgani and nearby areas) regularly generates more than 80% of India’s strawberry supply. In fact, in the latter part of a season, you can walk into most farms and they will let you pick and eat strawberry for free. Due to such prosperity, Mapro (Mahabaleshwar Products), the local giant in all stuff strawberry, has also started the Mapro Strawberry Festival to celebrate strawberry. Held every Easter weekend, Mapro Strawberry Festival is a four-day heaven for strawberry lovers. You can get the best of strawberry varieties like the Sweet Charlie, KamaRoza, Inter down, etc. along with the world famous Mahabaleshwar Strawberry, under one roof. Mouthwatering delicacies like Chocoberrywitch – a delectable dish of whole wheat bread, with chocolate sauce and freshly picked strawberries; Strawberry chocolate pizzas – pizzas with rich dark chocolate and strawberry toppings; Strawberry bhels – an excellent mix of corn and strawberries and many such exceptional concoctions are some of the irresistible strawberry-based dishes on offer. It is truly a heaven for strawberry lovers. The celebration is enlivened by traditional lezhim dances – an intricate dance forms that require amazing coordination and agility. Other events like Dandpatta – a martial art form; live orchestra crooning nostalgic Bollywood numbers and inviting everyone to dance and let their hair down; Mehendi and water color tattoo shops; along with a huge array of strawberry based products add to the fun of this festival. 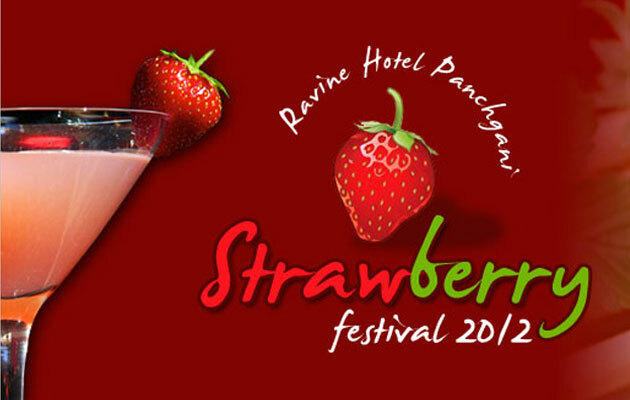 Visitors, both from India and overseas, regularly throng this event, booking well in advance with Ravine hotel, to ensure that they attend this festival and soak themselves up with Strawberry until their heart’s fill. And the fun’s not over.. the most amazing part of the entire event are the Strawberry picking walks. Young and old, all love to walk along the rows and rows of strawberry plants, and pick the most delicious, juicy strawberries that they see. Everyone has their own preferences, so such walks, not only allows them to eat free strawberry but also pick the exact sort that they prefer. The experience of walking in the cool Panchgani climate and enjoying fresh strawberries of your own choice is something that can only be felt rather than expressed.